1). Suppress appetite. 2). Reduce fatigue and enhance vitality. 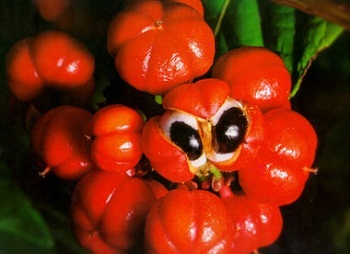 Guarana is a prominent ingredient and flavor in Brazilian and Venezuelan culinary culture, found in sodas, drinks, chocolates and as flavorings in sweets. Because of the high level of guaranine, an alternative name for caffeine, it has been considered a "miracle" drug for energy and weight loss and its inclusion has been advertised in a number of supplement and energy drink products. Aside from being a natural caffeine stimulant, guarana in all forms is a cherished and distinct flavor and is very dear to Brazilian culture. This product is applied in beverages, health care products and weight loss cosmetics. 25 kg cardboard box containing double plastic bag. The product should be stored in closed containers, protected from heat and moisture. Open containers must be closed immediately. 2 years when stored under the specified conditions.